Note that I went through this process in Visual Studio 2008, but the steps shouldn't be too different in VS2010. 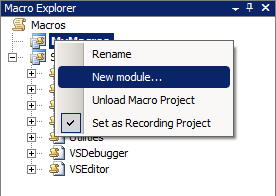 In Visual Studio click "Tools -> Macros -> Macro Explorer" (or just press Alt+F8). The Macro Explorer should open up. 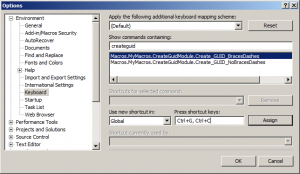 Right click "My Macros" and click "New module...". Give the new module a name and click Add. Double click the newly created module to open it in edit mode. Then add the code below into your new module. There's not a lot of magic going on here. We're creating a new GUID and replacing the current selected text with it. I'm using the B and N style formatting, but there are other options available. 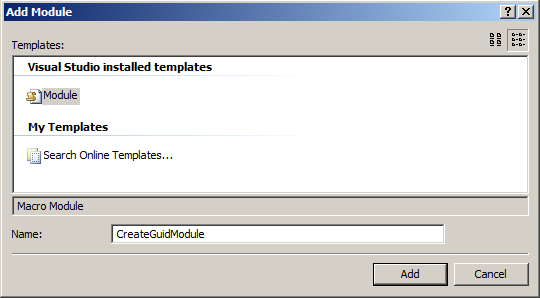 MSDN has a complete description of all available newGuid.ToString() formats. You can create one for each if you want, but I find these are the two that I use enough to warrant having a shortcut for. 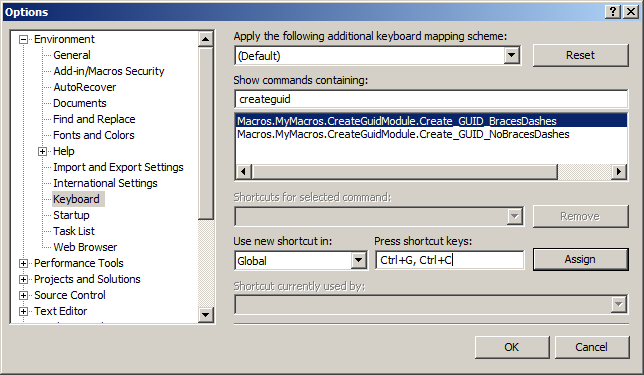 Now we just need to map the macros to a set of shortcut keys. Click "Tools -> Options" to open the Options dialog, and select Keyboard in the left hand side. In the "Show commands containing:" text box, type in part, or all, of what you named your module to filter and find your macros. Click the macro you want to assign to a new shortcut key and pick the shortcut you want. I have my macros mapped to Ctrl+G, Ctrl + G and Ctrl+G, Ctrl+C, although to do that you'll have to remove the Edit.Goto default shortcut which is Ctrl+G. Pick whatever you're comfortable with, then click Assign to set that shortcut combo to your macro. Repeat with the second macro. That's all there is to it. Now you can spit out Content Types faster than you can say GUID rhymes with squid. Have fun. Dear Technorati, are you joking? » « SharePoint 2010 and IntelliTrace – Can I really have my cake and eat it too?